Chef Valentine misses the boat. got into a ham mood. 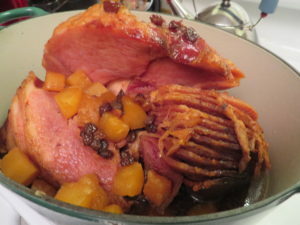 Yes, this recipe is for a spiral cut ham…. and had cut off the solid end for soup. I honestly have never seen Larry eat so much ham before. A lot of spiral hams are on sale after the holidays…. you might want to try it on a snowy day. My ham came with a seasoning packet. I used that too. 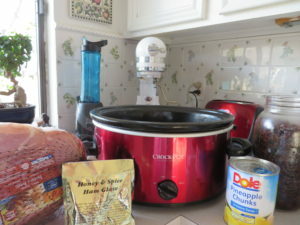 Cover the bottom of the crock pot with brown sugar. cutting off short end so the top closes. Sprinkle raisins over the ham. then the packet of seasoning that came with it. I did not make gravy out of the drippings, but next time I will. 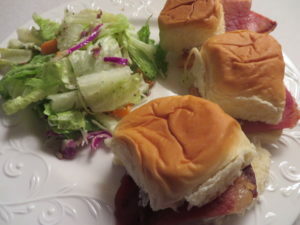 The flavor of this easy crock pot ham is absolutely amazing. we had it with hash brown casserole and green beans. I don’t think that I can wait till Easter to make this again.